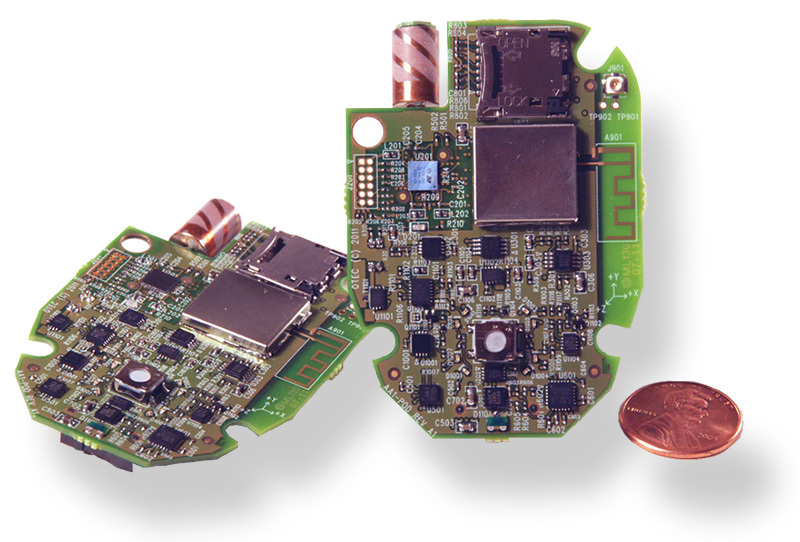 Custom wireless 802.15.4 transceivers from Orchid Technologies operate in the 900MHz, and 2.4GHz frequency bands. Occupying 802.15.4 channels 1 through 27, wireless communications on these frequencies can be very useful for low bandwidth data telemetry. IEEE 802.15.4 specifies a means of wireless data transmission. Application requirements can dictate actual data transmission protocols used. Orchid technologies has developed protocol variations for beacon enabled and non-beacon enabled networks. Lithium-ion and Lithium-polymer batteries provide high energy in small lightweight packages. Four hours of serviceable operation requires careful energy management. Dynamic power control, firmware power monitoring and power load management achieve extended operating times. Close proximity of the GPS receiver, 802.15.4 transceiver, and digital microcontroller signals required careful circuit floor planning. Careful circuit routing, shielding and planning maximizes radio link performance while managing subsystem interference. Build upon a 1mm thick circuit board, component parts where chosen for both their electrical performance and their physically small size. Close cooperation between industrial design and electronic design made this physically thin package a reality. Product trials were already scheduled when we began. Orchid had to deliver working units in eight weeks. Combining industrial design, electronic design and component engineering, Orchid crafted a rugged data collection device in record time. The development of custom electronic products for our OEM clients is Orchid’s entire business. The design of custom 802.15.4 wireless transceivers with rapid design cycles, demanding technical requirements, and unforgiving schedules sets us apart. Contact Orchid Technologies today! On the field performance really counts when the world title is on the line. Wireless data monitors from Orchid Technologies bring home the gold.